Download "Banking. Understanding banking in Canada"
2 Contents. 1: Getting started Opening your first bank account Accessing your money Sending money overseas Understanding credit in Canada : Managing your money today Borrowing for your needs Mortgages: Buying your home Starting your business Insurance: Protecting what s important : Planning for tomorrow Saving for your child s education Planning for retirement Understanding your finances Look for the RBC shield throughout this guide for RBC Royal Bank contact information and advice tips. 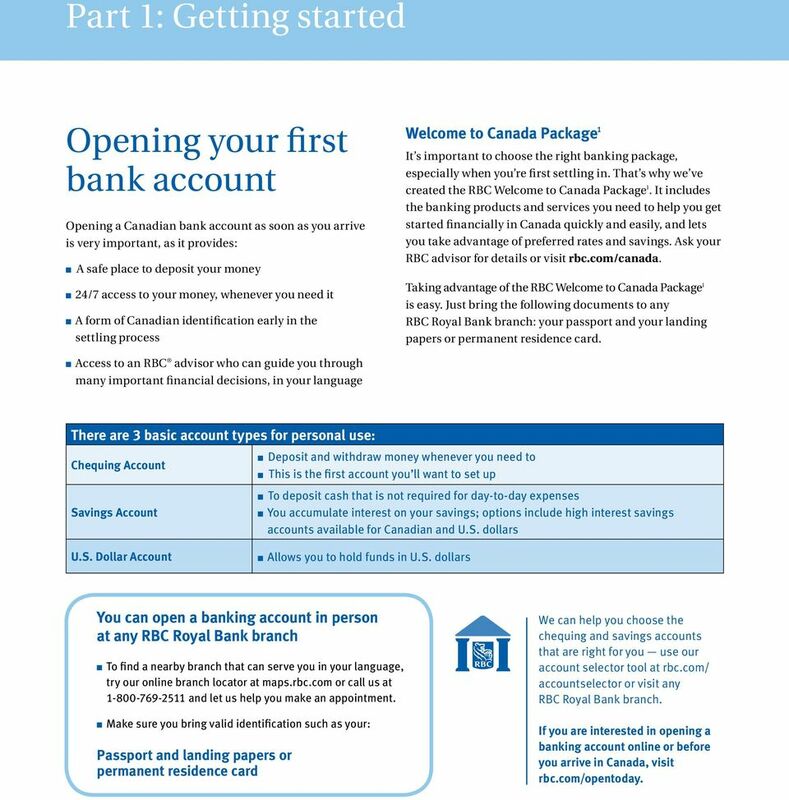 4 Understanding banking in Canada 4 Part 1: Getting started Opening your first bank account Opening a Canadian bank account as soon as you arrive is very important, as it provides: n A safe place to deposit your money n 24/7 access to your money, whenever you need it n A form of Canadian identification early in the settling process Welcome to Canada Package 1 It s important to choose the right banking package, especially when you re first settling in. That s why we ve created the RBC Welcome to Canada Package 1. It includes the banking products and services you need to help you get started financially in Canada quickly and easily, and lets you take advantage of preferred rates and savings. 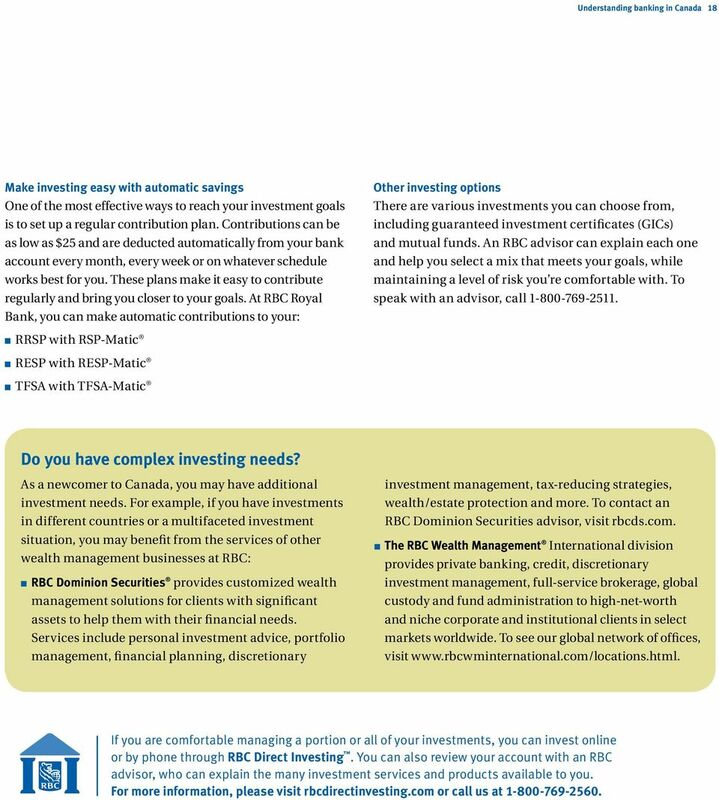 Ask your RBC advisor for details or visit rbc.com/canada. Taking advantage of the RBC Welcome to Canada Package 1 is easy. Just bring the following documents to any RBC Royal Bank branch: your passport and your landing papers or permanent residence card. n Access to an RBC advisor who can guide you through many important financial decisions, in your language There are 3 basic account types for personal use: Chequing Account Savings Account n Deposit and withdraw money whenever you need to n This is the first account you ll want to set up n To deposit cash that is not required for day-to-day expenses n You accumulate interest on your savings; options include high interest savings accounts available for Canadian and U.S. dollars U.S. Dollar Account n Allows you to hold funds in U.S. dollars You can open a banking account in person at any RBC Royal Bank branch n To find a nearby branch that can serve you in your language, try our online branch locator at maps.rbc.com or call us at and let us help you make an appointment. 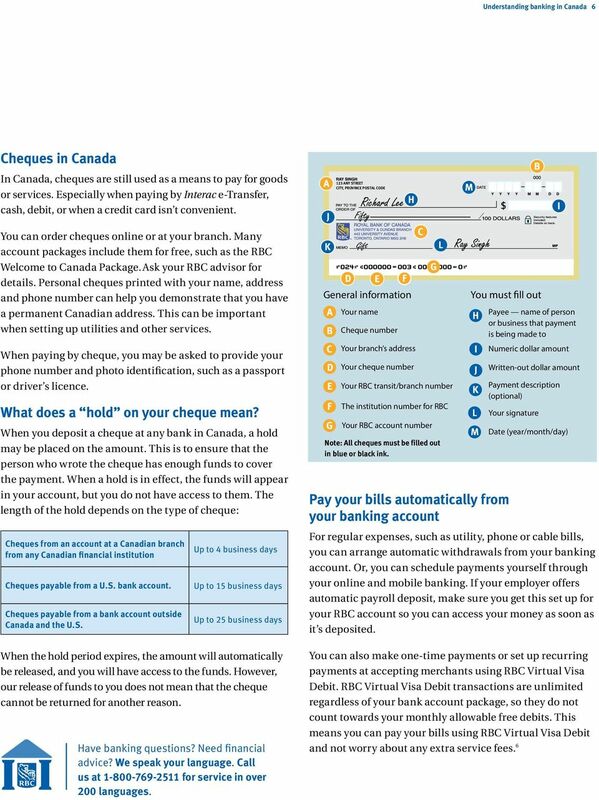 n Make sure you bring valid identification such as your: Passport and landing papers or permanent residence card We can help you choose the chequing and savings accounts that are right for you use our account selector tool at rbc.com/ accountselector or visit any RBC Royal Bank branch. If you are interested in opening a banking account online or before you arrive in Canada, visit rbc.com/opentoday. 5 5 Banking Accessing your money No matter which type of RBC banking account you choose, there are many safe and secure ways to access and manage your money: n RBC Royal Bank branch. Visit a branch during business hours and you can use your RBC Client Card to make withdrawals, pay bills and transfer funds. n ATM (automated teller machine). Use your RBC Client Card to make transactions at RBC, Interac and PLUS System (U.S.) ATMs. 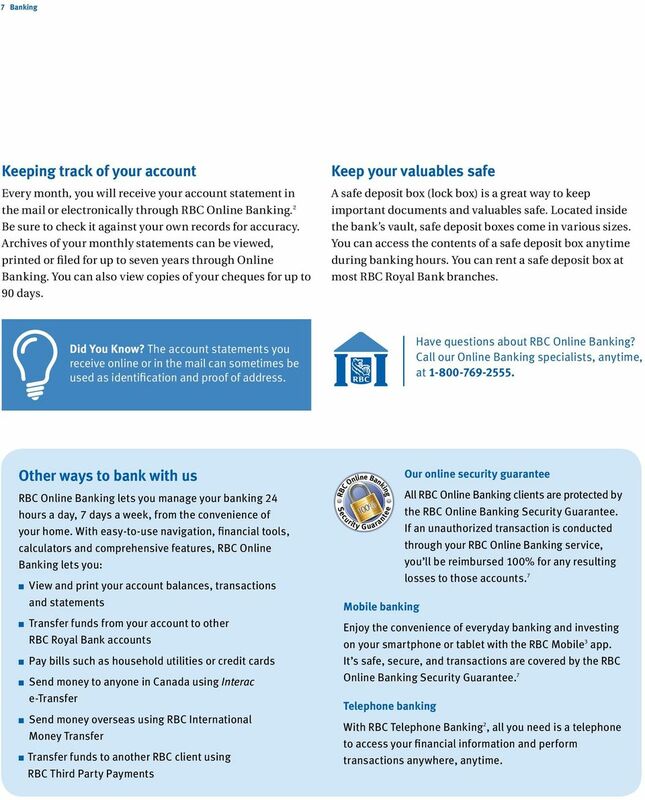 n RBC Online, Telephone 2 and Mobile Banking 3. Check your account balances, transfer funds between accounts, send money to others and pay bills 24 hours a day, wherever you are. Download the mobile app. n RBC Virtual Visa Debit. Another way to access funds from your bank account to pay for purchases made online, by phone or by mail order. 4 Accepted at over a million online retailers worldwide 5, this convenient payment option is a great way to pay for online purchases if you do not have, or prefer not to use, a credit card. Did You Know? With the largest combined branch and ATM network across Canada, you can bank anywhere you go in the country. Visit maps.rbc.com to locate your closest branch or ATM. 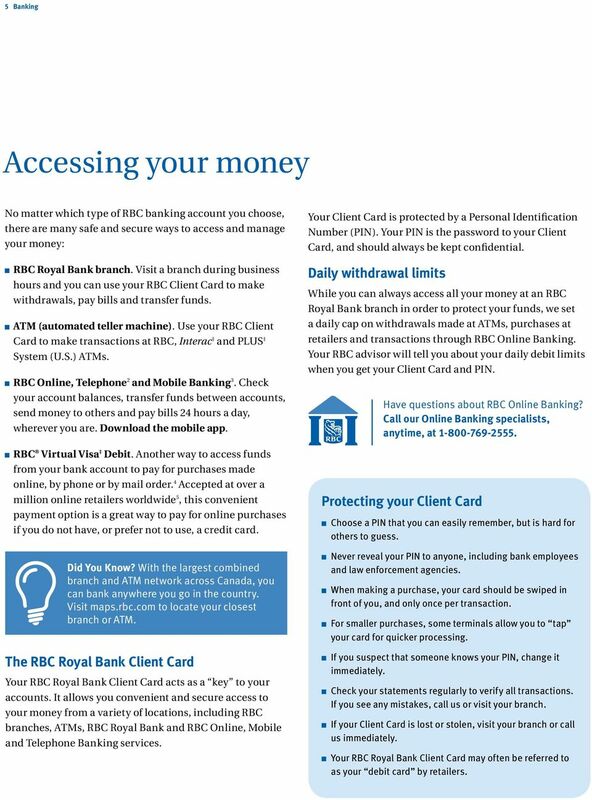 The RBC Royal Bank Client Card Your RBC Royal Bank Client Card acts as a key to your accounts. It allows you convenient and secure access to your money from a variety of locations, including RBC branches, ATMs, RBC Royal Bank and RBC Online, Mobile and Telephone Banking services. Your Client Card is protected by a Personal Identification Number (PIN). Your PIN is the password to your Client Card, and should always be kept confidential. Daily withdrawal limits While you can always access all your money at an RBC Royal Bank branch in order to protect your funds, we set a daily cap on withdrawals made at ATMs, purchases at retailers and transactions through RBC Online Banking. Your RBC advisor will tell you about your daily debit limits when you get your Client Card and PIN. Have questions about RBC Online Banking? Call our Online Banking specialists, anytime, at Protecting your Client Card n Choose a PIN that you can easily remember, but is hard for others to guess. n Never reveal your PIN to anyone, including bank employees and law enforcement agencies. n When making a purchase, your card should be swiped in front of you, and only once per transaction. n For smaller purchases, some terminals allow you to tap your card for quicker processing. n If you suspect that someone knows your PIN, change it immediately. n Check your statements regularly to verify all transactions. If you see any mistakes, call us or visit your branch. n If your Client Card is lost or stolen, visit your branch or call us immediately. n Your RBC Royal Bank Client Card may often be referred to as your debit card by retailers. 7 7 Banking Keeping track of your account Every month, you will receive your account statement in the mail or electronically through RBC Online Banking. 2 Be sure to check it against your own records for accuracy. Archives of your monthly statements can be viewed, printed or filed for up to seven years through Online Banking. You can also view copies of your cheques for up to 90 days. Keep your valuables safe A safe deposit box (lock box) is a great way to keep important documents and valuables safe. Located inside the bank s vault, safe deposit boxes come in various sizes. You can access the contents of a safe deposit box anytime during banking hours. You can rent a safe deposit box at most RBC Royal Bank branches. Did You Know? The account statements you receive online or in the mail can sometimes be used as identification and proof of address. Have questions about RBC Online Banking? Call our Online Banking specialists, anytime, at Other ways to bank with us RBC Online Banking lets you manage your banking 24 hours a day, 7 days a week, from the convenience of your home. With easy-to-use navigation, financial tools, calculators and comprehensive features, RBC Online Banking lets you: n View and print your account balances, transactions and statements n Transfer funds from your account to other RBC Royal Bank accounts n Pay bills such as household utilities or credit cards n Send money to anyone in Canada using Interac e-transfer n Send money overseas using RBC International Money Transfer n Transfer funds to another RBC client using RBC Third Party Payments Banking Banking Online RBC Security Guarantee Guarantee 100% Our online security guarantee All RBC Online Banking clients are protected by the RBC Online Banking Security Guarantee. If an unauthorized transaction is conducted through your RBC Online Banking service, you ll be reimbursed 100% for any resulting losses to those accounts. 7 Mobile banking Enjoy the convenience of everyday banking and investing on your smartphone or tablet with the RBC Mobile 3 app. It s safe, secure, and transactions are covered by the RBC Online Banking Security Guarantee. 7 Telephone banking With RBC Telephone Banking 2, all you need is a telephone to access your financial information and perform transactions anywhere, anytime. 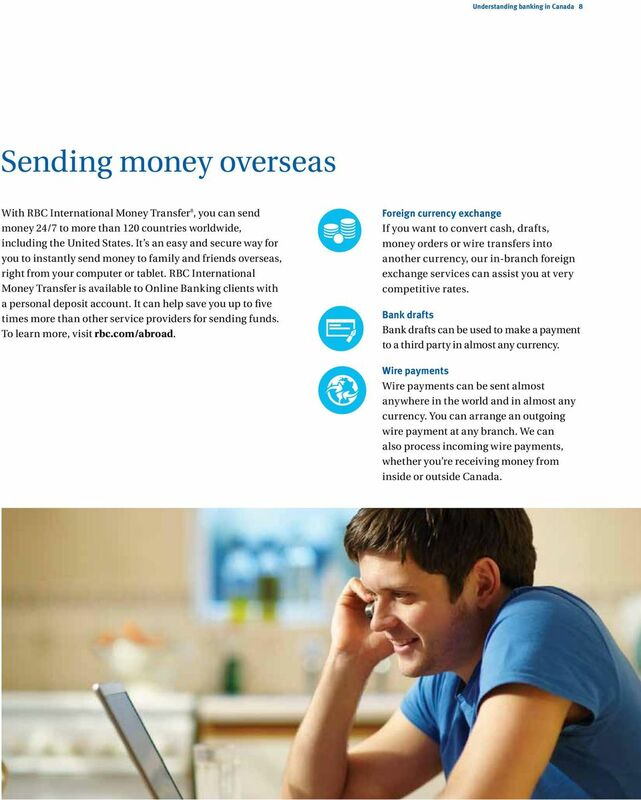 8 Understanding banking in Canada 8 Sending money overseas With RBC International Money Transfer 8, you can send money 24/7 to more than 120 countries worldwide, including the United States. It s an easy and secure way for you to instantly send money to family and friends overseas, right from your computer or tablet. RBC International Money Transfer is available to Online Banking clients with a personal deposit account. It can help save you up to five times more than other service providers for sending funds. To learn more, visit rbc.com/abroad. Foreign currency exchange If you want to convert cash, drafts, money orders or wire transfers into another currency, our in-branch foreign exchange services can assist you at very competitive rates. Bank drafts Bank drafts can be used to make a payment to a third party in almost any currency. Wire payments Wire payments can be sent almost anywhere in the world and in almost any currency. You can arrange an outgoing wire payment at any branch. We can also process incoming wire payments, whether you re receiving money from inside or outside Canada. 9 9 Banking Understanding credit in Canada In order to establish a positive credit history in Canada, you need access to credit. 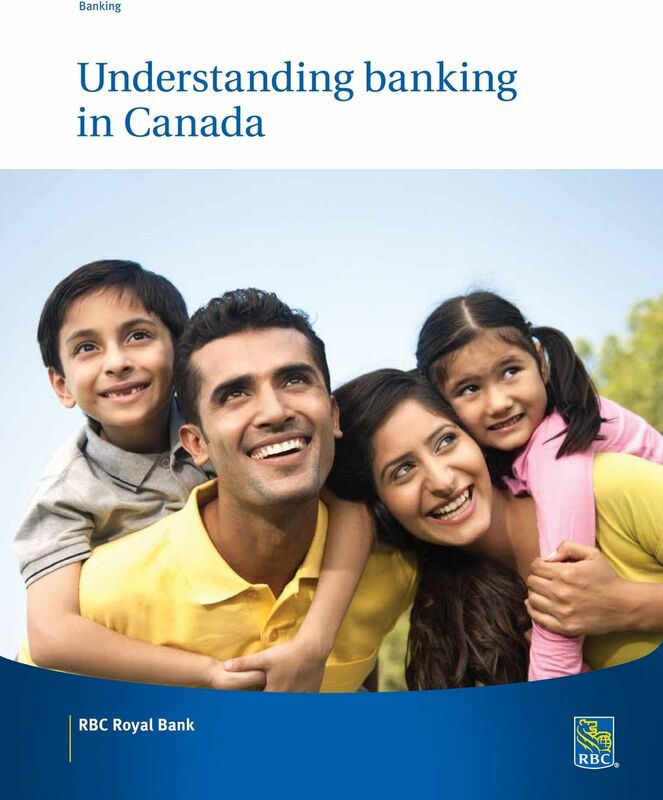 At RBC Royal Bank, we believe access to credit should be easy for new Canadians. That s why we offer credit cards 9, car loans 10 and home mortgages 11 with no credit history required. 12 You can get started right away at building a positive Canadian credit history. How to build a good credit history In Canada, when you pay your debts on time, you build a good credit history. 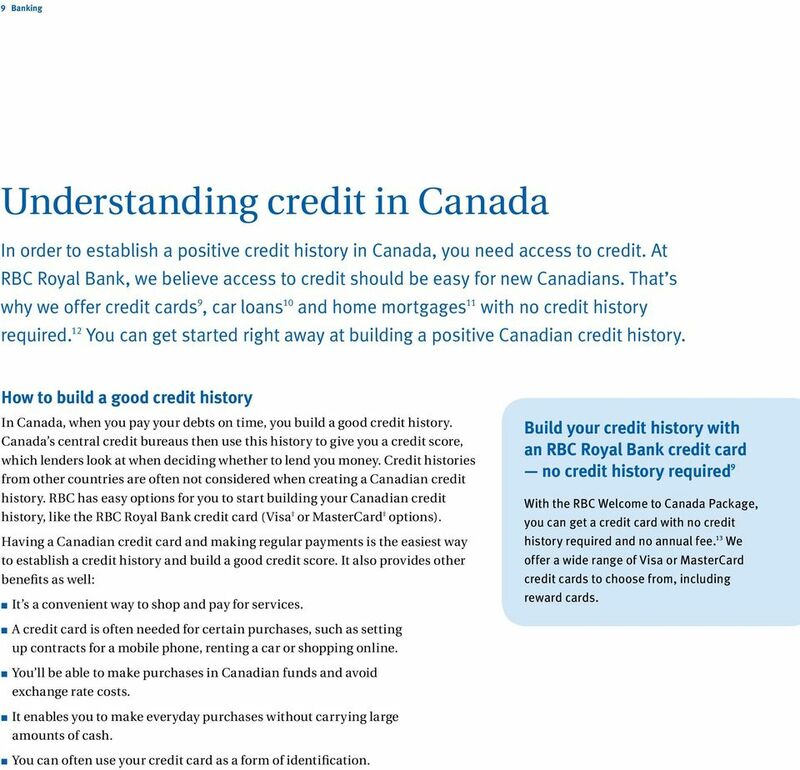 Canada s central credit bureaus then use this history to give you a credit score, which lenders look at when deciding whether to lend you money. Credit histories from other countries are often not considered when creating a Canadian credit history. RBC has easy options for you to start building your Canadian credit history, like the RBC Royal Bank credit card (Visa or MasterCard options). Having a Canadian credit card and making regular payments is the easiest way to establish a credit history and build a good credit score. It also provides other benefits as well: n It s a convenient way to shop and pay for services. Build your credit history with an RBC Royal Bank credit card no credit history required 9 With the RBC Welcome to Canada Package, you can get a credit card with no credit history required and no annual fee. 13 We offer a wide range of Visa or MasterCard credit cards to choose from, including reward cards. n A credit card is often needed for certain purchases, such as setting up contracts for a mobile phone, renting a car or shopping online. n You ll be able to make purchases in Canadian funds and avoid exchange rate costs. n It enables you to make everyday purchases without carrying large amounts of cash. n You can often use your credit card as a form of identification. 10 Understanding banking in Canada 10 Other secured credit card options Depending on your circumstances, you might benefit from using a secured RBC Royal Bank credit card. With a secured credit card, you decide how much credit you think you ll need and then deposit that amount as security for the card. For example, a $1,000 security pledge would give you a spending limit of $1,000 on your RBC Royal Bank credit card. The secured credit card must be applied for at an RBC Royal Bank branch. 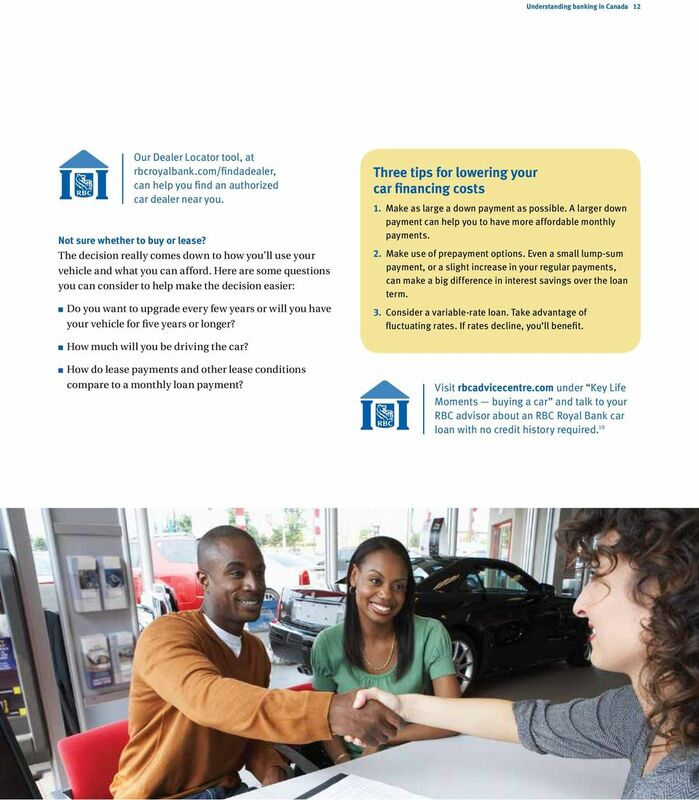 9 Part 2 of this guide will discuss credit solutions to help you buy your first car and your first home in Canada. Talk to your RBC advisor to find out more about your credit options. 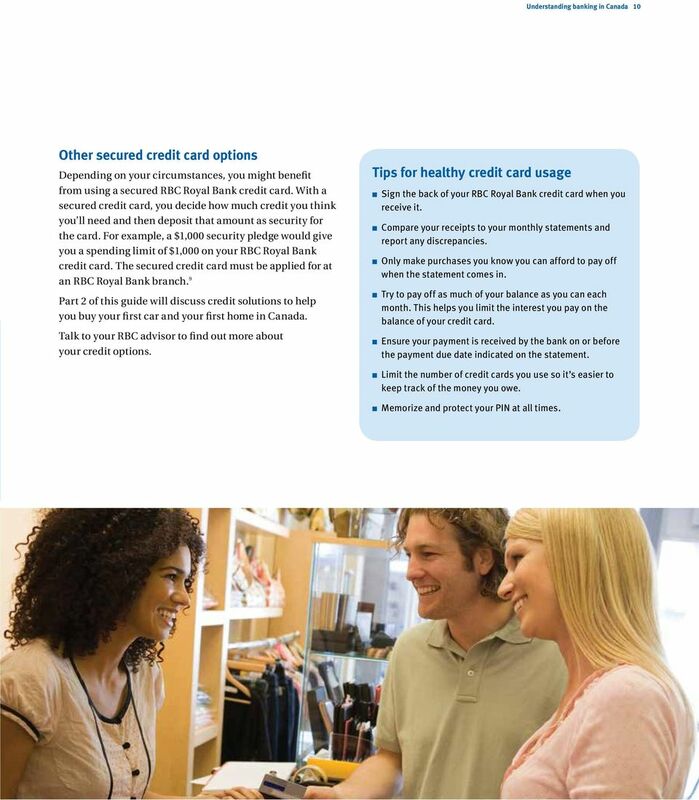 Tips for healthy credit card usage n Sign the back of your RBC Royal Bank credit card when you receive it. n Compare your receipts to your monthly statements and report any discrepancies. n Only make purchases you know you can afford to pay off when the statement comes in. n Try to pay off as much of your balance as you can each month. This helps you limit the interest you pay on the balance of your credit card. n Ensure your payment is received by the bank on or before the payment due date indicated on the statement. n Limit the number of credit cards you use so it s easier to keep track of the money you owe. n Memorize and protect your PIN at all times. 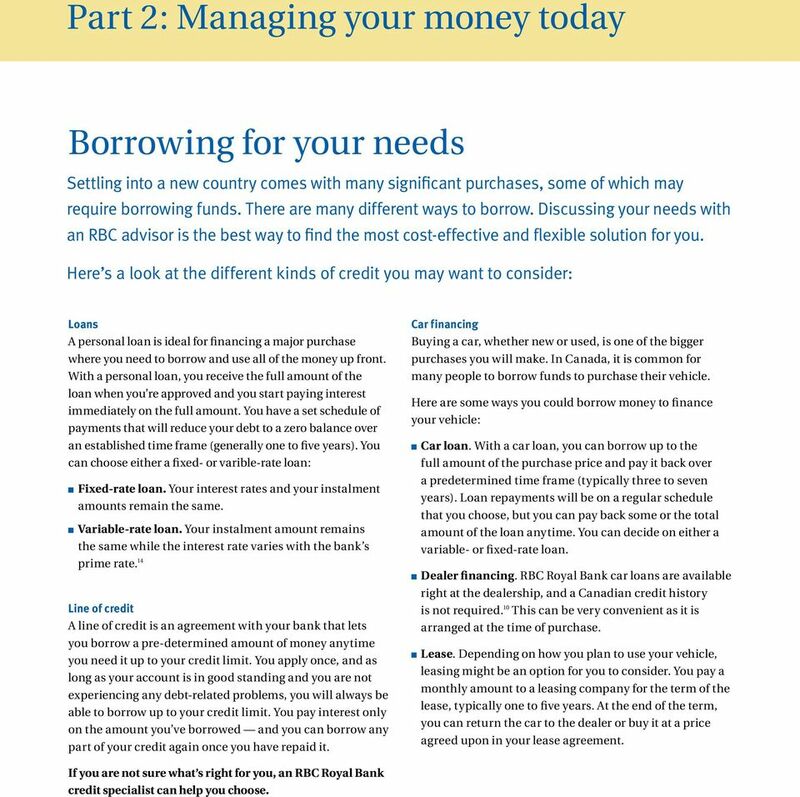 11 11 Banking Part 2: Managing your money today Borrowing for your needs Settling into a new country comes with many significant purchases, some of which may require borrowing funds. There are many different ways to borrow. Discussing your needs with an RBC advisor is the best way to find the most cost-effective and flexible solution for you. Here s a look at the different kinds of credit you may want to consider: Loans A personal loan is ideal for financing a major purchase where you need to borrow and use all of the money up front. With a personal loan, you receive the full amount of the loan when you re approved and you start paying interest immediately on the full amount. You have a set schedule of payments that will reduce your debt to a zero balance over an established time frame (generally one to five years). You can choose either a fixed- or varible-rate loan: n Fixed-rate loan. Your interest rates and your instalment amounts remain the same. n Variable-rate loan. Your instalment amount remains the same while the interest rate varies with the bank s prime rate. 14 Line of credit A line of credit is an agreement with your bank that lets you borrow a pre-determined amount of money anytime you need it up to your credit limit. You apply once, and as long as your account is in good standing and you are not experiencing any debt-related problems, you will always be able to borrow up to your credit limit. You pay interest only on the amount you ve borrowed and you can borrow any part of your credit again once you have repaid it. Car financing Buying a car, whether new or used, is one of the bigger purchases you will make. In Canada, it is common for many people to borrow funds to purchase their vehicle. Here are some ways you could borrow money to finance your vehicle: n Car loan. With a car loan, you can borrow up to the full amount of the purchase price and pay it back over a predetermined time frame (typically three to seven years). Loan repayments will be on a regular schedule that you choose, but you can pay back some or the total amount of the loan anytime. You can decide on either a variable- or fixed-rate loan. n Dealer financing. RBC Royal Bank car loans are available right at the dealership, and a Canadian credit history is not required. 10 This can be very convenient as it is arranged at the time of purchase. n Lease. Depending on how you plan to use your vehicle, leasing might be an option for you to consider. You pay a monthly amount to a leasing company for the term of the lease, typically one to five years. At the end of the term, you can return the car to the dealer or buy it at a price agreed upon in your lease agreement. 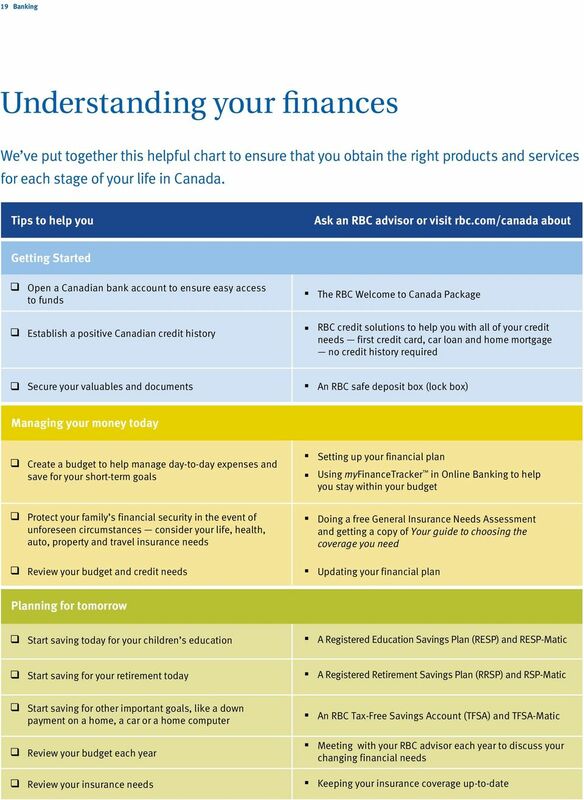 If you are not sure what s right for you, an RBC Royal Bank credit specialist can help you choose. 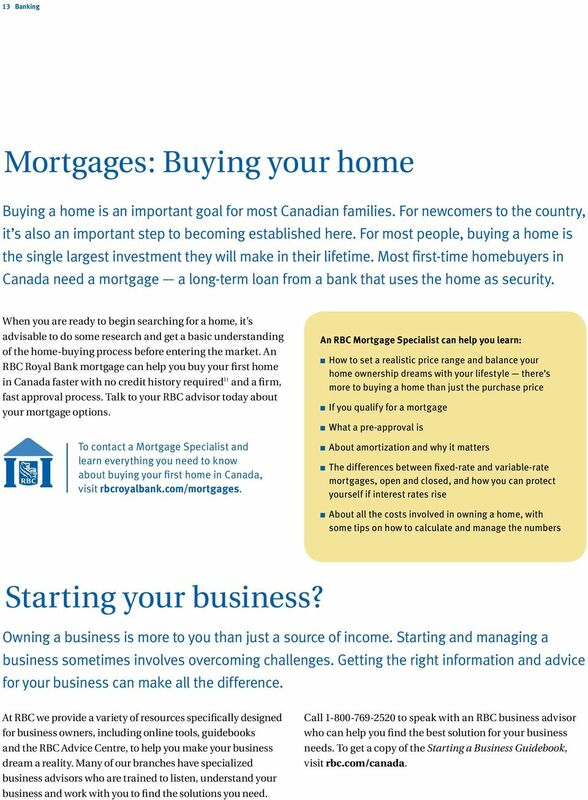 13 13 Banking Mortgages: Buying your home Buying a home is an important goal for most Canadian families. For newcomers to the country, it s also an important step to becoming established here. For most people, buying a home is the single largest investment they will make in their lifetime. Most first-time homebuyers in Canada need a mortgage a long-term loan from a bank that uses the home as security. When you are ready to begin searching for a home, it s advisable to do some research and get a basic understanding of the home-buying process before entering the market. An RBC Royal Bank mortgage can help you buy your first home in Canada faster with no credit history required 11 and a firm, fast approval process. Talk to your RBC advisor today about your mortgage options. To contact a Mortgage Specialist and learn everything you need to know about buying your first home in Canada, visit rbcroyalbank.com/mortgages. An RBC Mortgage Specialist can help you learn: n How to set a realistic price range and balance your home ownership dreams with your lifestyle there s more to buying a home than just the purchase price n If you qualify for a mortgage n What a pre-approval is n About amortization and why it matters n The differences between fixed-rate and variable-rate mortgages, open and closed, and how you can protect yourself if interest rates rise n About all the costs involved in owning a home, with some tips on how to calculate and manage the numbers Starting your business? Owning a business is more to you than just a source of income. Starting and managing a business sometimes involves overcoming challenges. Getting the right information and advice for your business can make all the difference. At RBC we provide a variety of resources specifically designed for business owners, including online tools, guidebooks and the RBC Advice Centre, to help you make your business dream a reality. Many of our branches have specialized business advisors who are trained to listen, understand your business and work with you to find the solutions you need. Call to speak with an RBC business advisor who can help you find the best solution for your business needs. To get a copy of the Starting a Business Guidebook, visit rbc.com/canada. 14 Understanding banking in Canada 14 Insurance: Protecting what s important Insurance is an important part of any financial plan that protects you and your family from unexpected circumstances. 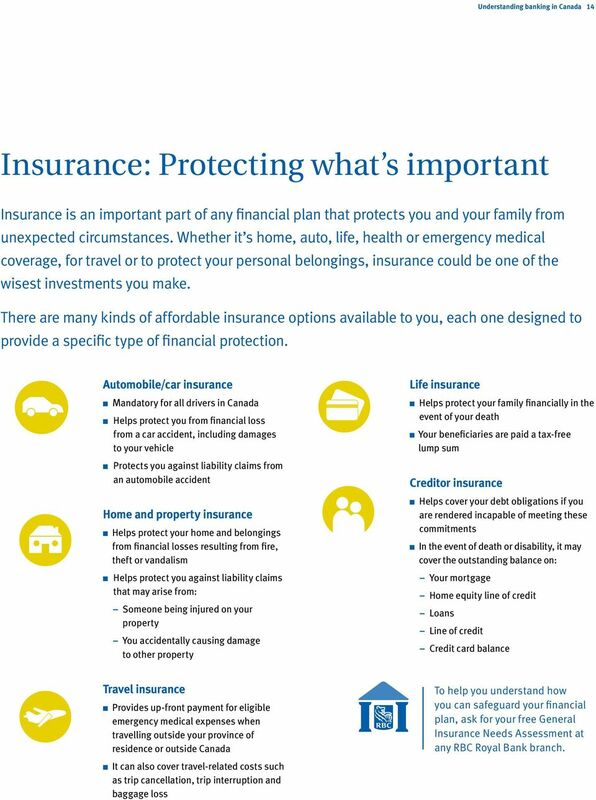 Whether it s home, auto, life, health or emergency medical coverage, for travel or to protect your personal belongings, insurance could be one of the wisest investments you make. There are many kinds of affordable insurance options available to you, each one designed to provide a specific type of financial protection. Automobile/car insurance n Mandatory for all drivers in Canada n Helps protect you from financial loss from a car accident, including damages to your vehicle n Protects you against liability claims from an automobile accident Home and property insurance n Helps protect your home and belongings from financial losses resulting from fire, theft or vandalism n Helps protect you against liability claims that may arise from: Someone being injured on your property You accidentally causing damage to other property Life insurance n Helps protect your family financially in the event of your death n Your beneficiaries are paid a tax-free lump sum Creditor insurance n Helps cover your debt obligations if you are rendered incapable of meeting these commitments n In the event of death or disability, it may cover the outstanding balance on: Your mortgage Home equity line of credit Loans Line of credit Credit card balance Travel insurance n Provides up-front payment for eligible emergency medical expenses when travelling outside your province of residence or outside Canada n It can also cover travel-related costs such as trip cancellation, trip interruption and baggage loss To help you understand how you can safeguard your financial plan, ask for your free General Insurance Needs Assessment at any RBC Royal Bank branch. 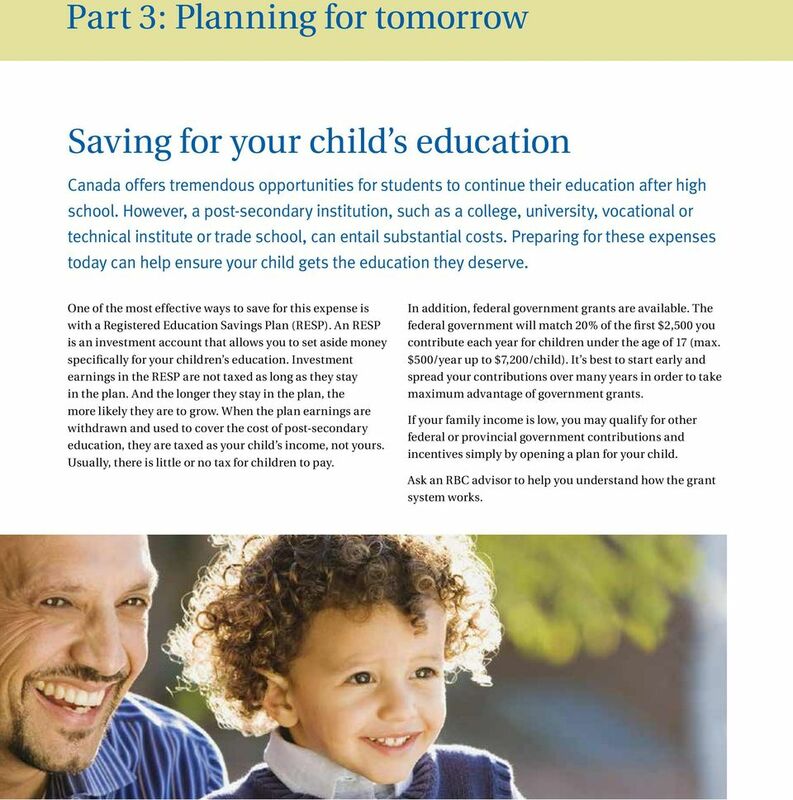 15 15 Banking Part 3: Planning for tomorrow Saving for your child s education Canada offers tremendous opportunities for students to continue their education after high school. However, a post-secondary institution, such as a college, university, vocational or technical institute or trade school, can entail substantial costs. Preparing for these expenses today can help ensure your child gets the education they deserve. One of the most effective ways to save for this expense is with a Registered Education Savings Plan (RESP). An RESP is an investment account that allows you to set aside money specifically for your children s education. Investment earnings in the RESP are not taxed as long as they stay in the plan. And the longer they stay in the plan, the more likely they are to grow. When the plan earnings are withdrawn and used to cover the cost of post-secondary education, they are taxed as your child s income, not yours. Usually, there is little or no tax for children to pay. In addition, federal government grants are available. The federal government will match 20% of the first $2,500 you contribute each year for children under the age of 17 (max. $500/year up to $7,200/child). It s best to start early and spread your contributions over many years in order to take maximum advantage of government grants. If your family income is low, you may qualify for other federal or provincial government contributions and incentives simply by opening a plan for your child. Ask an RBC advisor to help you understand how the grant system works. 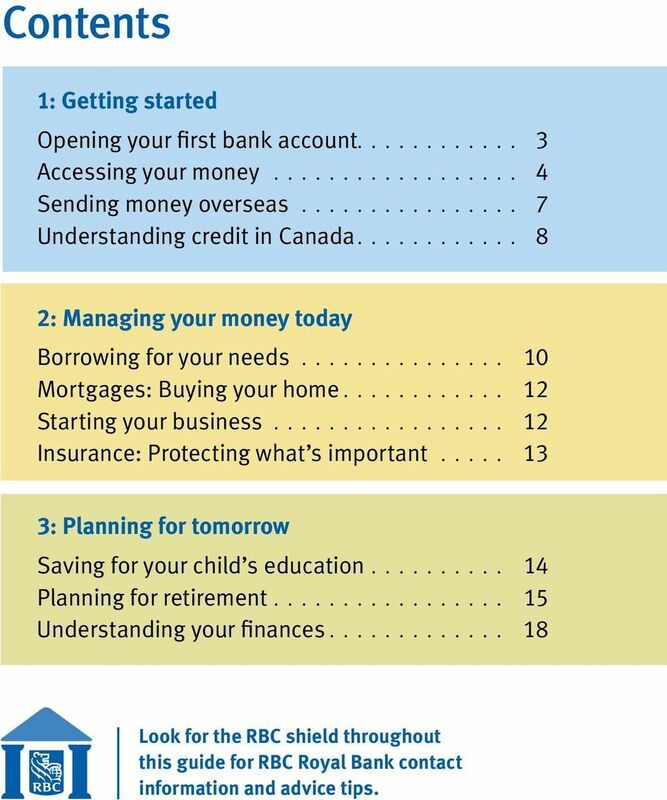 16 Understanding banking in Canada 16 Planning for retirement Once you begin to feel settled with a job and home, you are likely to start thinking about the future. What steps do you need to take today to secure you and your family s lifestyle in the future? Where will your money come from when you stop working? What will your life be like? A simple retirement plan can allow you to confidently make your own life choices, even after you ve stopped working. Where retirement money comes from Retired people in Canada may receive money regularly from a number of different sources. 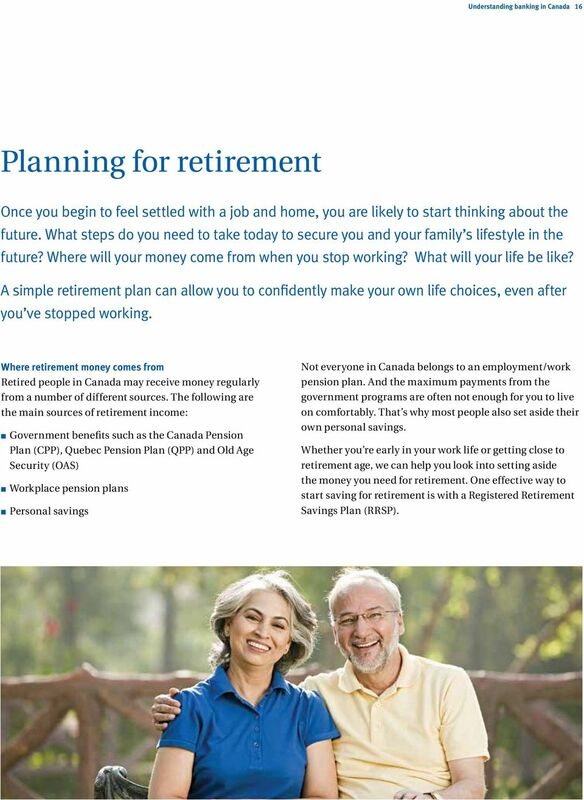 The following are the main sources of retirement income: n Government benefits such as the Canada Pension Plan (CPP), Quebec Pension Plan (QPP) and Old Age Security (OAS) n Workplace pension plans n Personal savings Not everyone in Canada belongs to an employment/work pension plan. And the maximum payments from the government programs are often not enough for you to live on comfortably. That s why most people also set aside their own personal savings. Whether you re early in your work life or getting close to retirement age, we can help you look into setting aside the money you need for retirement. 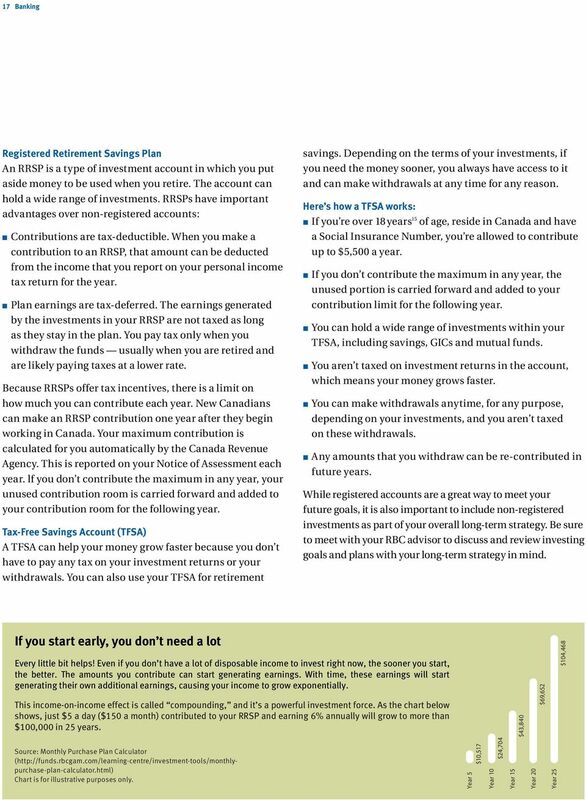 One effective way to start saving for retirement is with a Registered Retirement Savings Plan (RRSP). 20 Understanding banking in Canada Available only to newcomers to Canada who have arrived in Canada within the last year and who show proof of permanent resident status. Also available to newcomers to Canada who have arrived between 1 and 3 years when clients switch their account from another financial institution using CustomSwitch. Other conditions apply. See branch for details. This offer may be withdrawn at any time and is subject to change without notice. 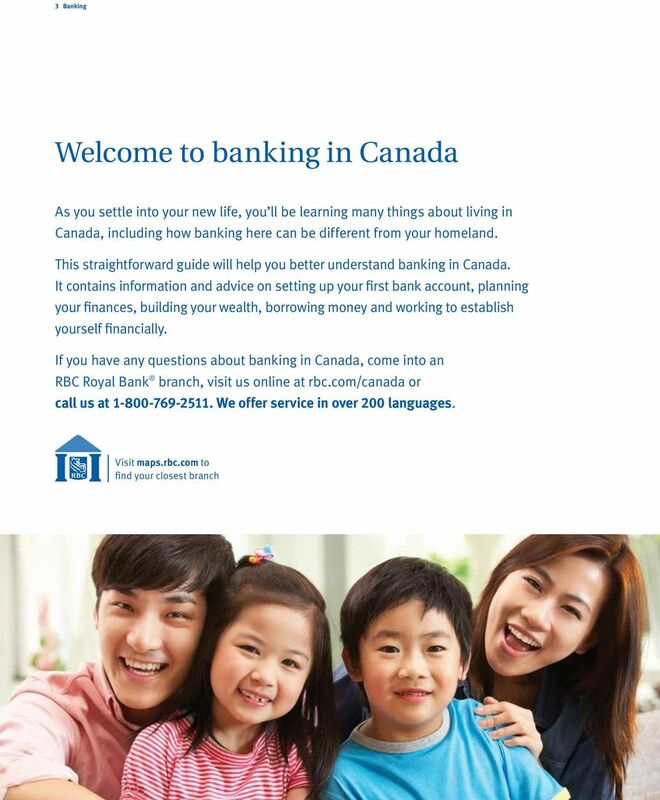 RBC Online Banking and Telephone Banking is provided by Royal Bank of Canada. Standard message and data charges apply. Transaction fees may apply for bill payments or fund transfers made through Online Banking and are separate from access fees. RBC Mobile is operated by Royal Bank of Canada, RBC Direct Investing Inc. and RBC Dominion Securities Inc. When you use Virtual Visa Debit to make a payment: a) b) The merchant performs an authorization on your personal deposit account at the time of the purchase and this authorization amount is immediately debited from that account. This process is followed by a settlement, typically 2-5 business days after authorization, which finalizes the amount of the purchase and, in some cases, reflects adjustments to the initial authorization amount. When this happens, a credit adjustment in the amount of the original authorization will be credited to your account, followed immediately by a debit adjustment that reflects the final settlement amount of your purchase. The funds are debited from your personal deposit account, which is the account you access with your RBC Royal Bank Client Card when you select the Chequing option on a point-of-sale terminal or at an ATM. If the account linked to the primary chequing position on your Client Card is changed before a payment has been settled, it may impact the processing of that payment if the merchant needs to adjust the initial authorization amount. The final settlement amount will be processed on the account that is linked to the primary chequing position on your Client Card at the time of settlement, even if a different account was debited for the authorization amount. Please see your RBC Royal Bank Virtual Visa Debit Agreement for further details. When you use your Virtual Visa Debit Number for a transaction in a currency other than Canadian dollars, we will convert the transaction amount into Canadian dollars at an exchange rate that is 2.5% over a benchmark rate Royal Bank of Canada pays Visa International, a subsidiary of Visa Inc., on the date of the conversion. For most transactions, the authorization amount debited by the merchant at the time of purchase will be adjusted at settlement to reflect changes in the applicable exchange rate. 6 Debit transactions made using your Virtual Visa Debit Number do not count against any monthly transaction limits applicable to your personal deposit account. Other account fees may apply. Please see the RBC Royal Bank Disclosures and Agreements related to Personal Deposit Accounts booklet or other applicable account agreement for further details. 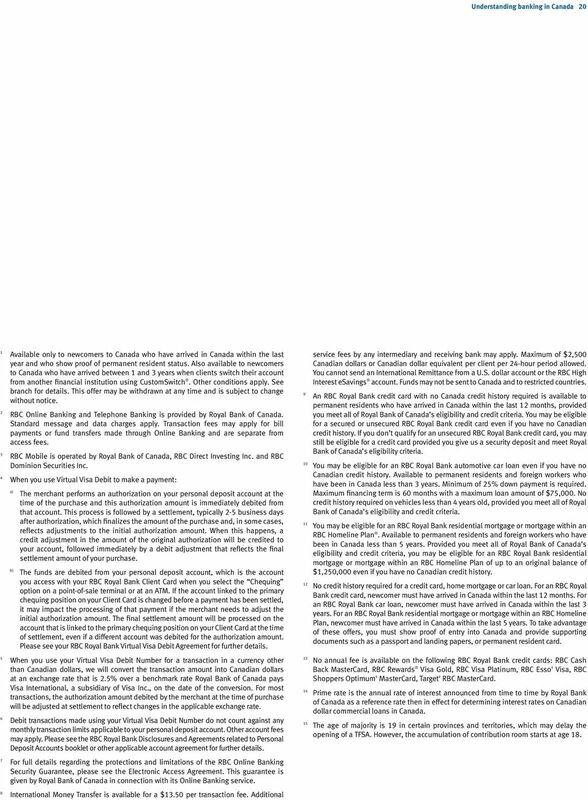 7 For full details regarding the protections and limitations of the RBC Online Banking Security Guarantee, please see the Electronic Access Agreement. This guarantee is given by Royal Bank of Canada in connection with its Online Banking service. 8 International Money Transfer is available for a $13.50 per transaction fee. Additional service fees by any intermediary and receiving bank may apply. Maximum of $2,500 Canadian dollars or Canadian dollar equivalent per client per 24-hour period allowed. You cannot send an International Remittance from a U.S. dollar account or the RBC High Interest esavings account. Funds may not be sent to Canada and to restricted countries. An RBC Royal Bank credit card with no Canada credit history required is available to permanent residents who have arrived in Canada within the last 12 months, provided you meet all of Royal Bank of Canada s eligibility and credit criteria. You may be eligible for a secured or unsecured RBC Royal Bank credit card even if you have no Canadian credit history. If you don t qualify for an unsecured RBC Royal Bank credit card, you may still be eligible for a credit card provided you give us a security deposit and meet Royal Bank of Canada s eligibility criteria. You may be eligible for an RBC Royal Bank automotive car loan even if you have no Canadian credit history. Available to permanent residents and foreign workers who have been in Canada less than 3 years. Minimum of 25% down payment is required. Maximum financing term is 60 months with a maximum loan amount of $75,000. No credit history required on vehicles less than 4 years old, provided you meet all of Royal Bank of Canada s eligibility and credit criteria. You may be eligible for an RBC Royal Bank residential mortgage or mortgage within an RBC Homeline Plan. Available to permanent residents and foreign workers who have been in Canada less than 5 years. Provided you meet all of Royal Bank of Canada s eligibility and credit criteria, you may be eligible for an RBC Royal Bank residential mortgage or mortgage within an RBC Homeline Plan of up to an original balance of $1,250,000 even if you have no Canadian credit history. No credit history required for a credit card, home mortgage or car loan. For an RBC Royal Bank credit card, newcomer must have arrived in Canada within the last 12 months. For an RBC Royal Bank car loan, newcomer must have arrived in Canada within the last 3 years. For an RBC Royal Bank residential mortgage or mortgage within an RBC Homeline Plan, newcomer must have arrived in Canada within the last 5 years. To take advantage of these offers, you must show proof of entry into Canada and provide supporting documents such as a passport and landing papers, or permanent resident card. No annual fee is available on the following RBC Royal Bank credit cards: RBC Cash Back MasterCard, RBC Rewards Visa Gold, RBC Visa Platinum, RBC Esso Visa, RBC Shoppers Optimum MasterCard, Target RBC MasterCard. Prime rate is the annual rate of interest announced from time to time by Royal Bank of Canada as a reference rate then in effect for determining interest rates on Canadian dollar commercial loans in Canada. 15 The age of majority is 19 in certain provinces and territories, which may delay the opening of a TFSA. However, the accumulation of contribution room starts at age 18. The best of both worlds Low interest and convenience. BNZ Advantage Credit Card Terms and Conditions. Mates Rates Package. From your friends at Kiwibank. elcome to Webster Personal Banking. For Your Convenience Our Customer Care Center is open 7 am - 10 pm, 7 days a week. For Your Convenience Our Customer Care Center is open 7 am - 0 pm, 7 days a week. Call -888-4WEBSTER (-888-493-2783) We also have over 65 branches and almost 500 ATMs so that you can bank on your schedule. Destiny a guide for clients 1 For those who prefer choice over chance Destiny is universal life insurance that provides a broad spectrum of choices to protect your life, your investments, and your business. A rewarding experience just for you. Lower Interest Rate. Higher Savings. In addition, Butterfield Line can help you manage those unexpected expenses, like home and auto repairs or the replacement of major appliances. 1.4. Will my Social Security and Supplemental Security Income benefits be safe? Yes, your card will expire at a given date, which is printed on the front of your card. Uneasy about getting started? Not to worry. SageLink Credit Union has trained employees to help you every step of the way. YOUR SOURCE FOR RETIREMENT PLANNING AND POSSIBILITIES e > N xt WHAT S AFTER? But first, some things to think about before 4Needs your retirement income should meet ELIMINATE DEBT THE FEWER DEBTS, THE BETTER! www.pulaskibankstl.com Electronic Funds Transfer ELECTRONIC FUND TRANSFER AGREEMENT AND DISCLOSURE For purposes of this disclosure and agreement the terms "we", "us" and "our" refer to. The terms "you"
SPECIAL OFFERS FOR GOOD CITIZENS. great ways to help you save and look ahead.